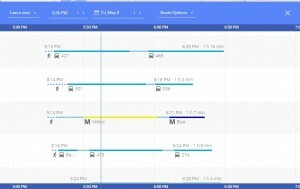 Google Map Route Planner – Find live public transit and Estimated time travel. 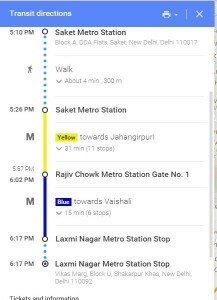 Google launched public transport Trip planner providing real time transit update for more than 800 cities world wide, for public welfare as a free service. 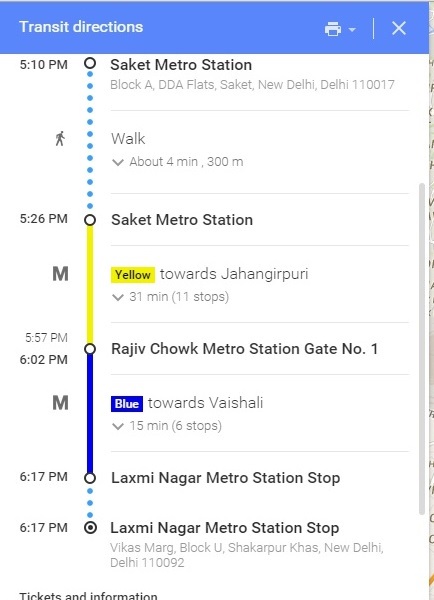 This feature will help you know the next bus estimated time of arrival at your source, estimated time to travel from one location to another, answers which bus or train or any public transport vehicle you need to take and most importantly give you direction and guidance with live update. Surely Google Maps is one of the most used Maps Engine, where you can Measure Straight Distance, create your own map, find live traffic, know your location history and many more. But Route planner is one of the best feature I have ever used while travelling at unknown places via public transportation. With this feature you don’t need to wait at bus or metro stop, looking for next vehicle as you receive the live Estimated time of Arrival information of next Public transit vehicle. Google get this data from the different public transit service provider across the world. Google have created the General Transit Feed Specification where transportation agency provider uploads the required data, for easily exchange of transit information. If you are one of the transportation service provider for public and operates with fixed schedules and routes, then you may Join transit partner program from here for free. 1.) Open up Google Map either in Lite Mode or in Full controlled New Google Map. 2.) Click on Direction arrow, which you may find on the text box located at top right. 3.) Now Enter the Source and Destination address location. 4.) Click on Train or Bus type of icon, which signifies Public transit and press Search. 5.) Wow! you will get all possible result to travel from Place A (Source) to Place B(Destination), with next ETA (Estimated Time of Arrival) of vehicle at Stop A, Estimated travel time (ETT), path and Total fare (Fare is not mentioned in every path). Walking distance and estimated time to reach to a Metro Station. Take Yellow line Metro, with heading or direction is described. Estimated time of arrival of next metro at your stop. Station where i need to switch to different Metro. Total estimated time of travel. Public Transit Service provider, and its contact number. Note: For some areas, you may also get the estimated fare charges to travel from Source to Destination. When i tested the Google Transit Trip planner feature and travel the path, with no surprise the result was very appropriate as Google used the transit data and implemented an intellectual algorithm on it. Estimated time of arrival (ETA) of Metro, Estimated time to travel(ETT) and the most important the correct path or guidance described. Result: Application Estimated Travel time = 1 hour 16 Minutes. Actual Estimate Travel Time = 1 hour 19 Minutes. Isn’t that wonderful, the result was very close. 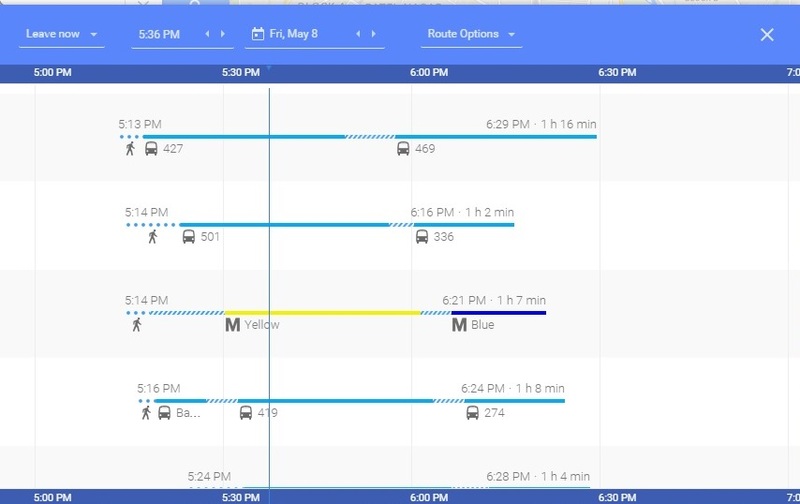 Even if you depends on Public transit to travel, with the help of Google Map Public Transit Route planner feature, you are able to schedule your own route and most certainly avoiding the waiting time at stops as now you know the estimated time of arrival of next public vehicle. I loved this feature of Google Map. Have you tried this feature of Google Map? What was the result? Do you know any alternative to this feature? Share your thoughts by commenting below.